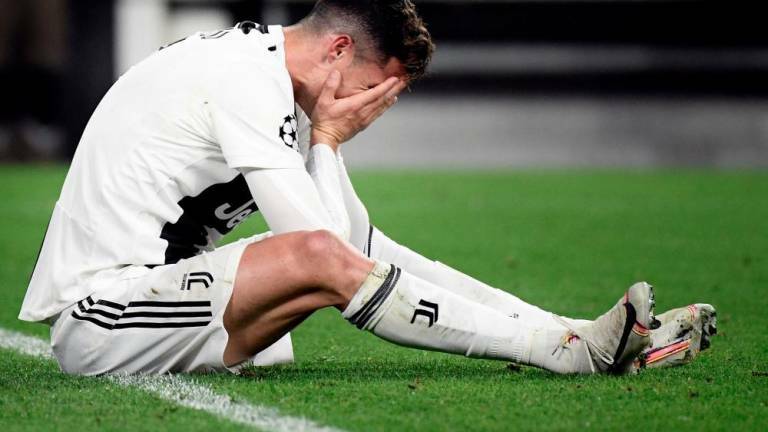 17 Apr 2019 / 21:07 H.
TURIN, ITALY: Even Cristiano Ronaldo was not enough for Juventus to end their 23-year wait for the European title as they crashed out in the Champions League quarter-finals for a second consecutive year. Juventus splashed out €100 million (US$117 million) on the five-time Champions League winner last summer and the Portuguese star headed in his 126th Champions League goal to put the home team in front on Tuesday. “Apocalypse,“ read the headline in daily Corriere dello sport, as Juventus shares plunged 15% on Wednesday on the Milan stock exchange. “Not even a huge investment like Ronaldo was enough to win a title that Juve have been searching for since 1996,“ the sports daily added. Ronaldo was bought to change that and was handed an annual salary of €31 million. He has won the title five times and scored a 97th-minute penalty for Real Madrid against Juventus last season in the quarter-finals. “Football isn’t maths,“ said Allegri. He holds the record for goals scored — which includes 65 goals in the knockout rounds, another record. “Ajax deserved to qualify and you saw that on the pitch,“ said Juventus president Andrea Agnelli, who said Allegri would be continuing as coach. “For our part, we are aware of having been in the Champions League quarter-finals for five or six years and are proud to continue this path,“ said Agnelli. “I’m looking at the big picture,“ Agnelli said. Ronaldo was a heavy investment with the club announcing expected losses for this season, having gone €19.2 million into the red for the 2017/2018 campaign.